Our passion for pet nutrition comes from our own personal experiences and interest in health and well-being. GUNNER was living on the west coast, feeding his dogs the best kibble he could find, until his veterinarian, a raw food advocate, suggested he try raw dog food. Gunner found a local provider and started Max and Dakota on a raw diet. Within two weeks he noticed a difference for the better! Both dogs' energy levels went through the roof!! They leaned out, and their skin problems cleared up too. Having a bs in nutritional science and agriculture, Gunner spent years working at the famed Canyon Ranch, where he was exposed to holistic health practices and preventive medicine. He became an Environmental Health Specialist and Registered Sanitarian. As a Health Inspector, Gunner learned the HACCP system which helped him develop safe food handling practices and production skills. AJ was living on the east coast, has a bfa and mfa, and spent years working in retail management, customer service, and owned her own art business. Sparked by her family health history and her own health concerns, AJ researches and implements Nutritional Therapy. Gunner and AJ met and the rest is history..."wonder-twins" powers ACTIVATE!!! 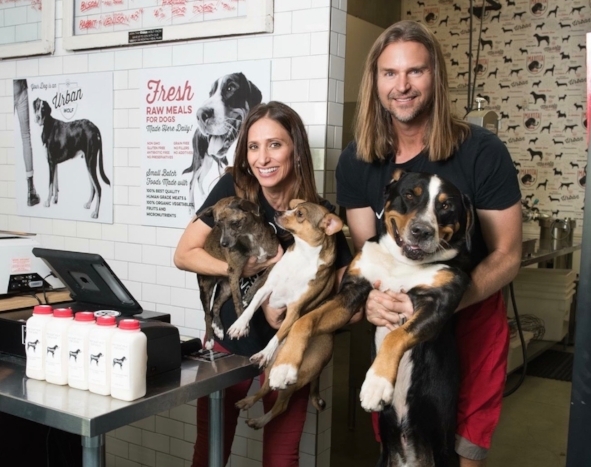 When they welcomed Duke into their lives, they knew what they had to do... create their own natural, healthy, fresh, wholesome raw dog food! A business was born! After 3 years of research and development, and 2 more dogs (diego and chico), Gunner and AJ moved to beautiful San Diego to launch MAXOTA RAW, named in honor of max and dakota. That's our story. Pure, simple, and filled with love. we're committed to health, well-being, and love for animals.